And yes, it will come to the US. We’re fully aware Audi will debut a new Q3 crossover sometime in the middle of 2018, but what we’re now learning is that the high performance RS version is going to be certifiably bonkers. According to German language publication Auto Motor und Sport, the new RSQ3 will have around 400 hp. And yes, Audi is planning on bringing this little beast of a thing stateside. Why let Europeans have all of the crossover fun? A new SQ3 is also in the works, and it’ll likely come powered by the familiar 2.5-liter five-cylinder, this time tuned to the neighborhood of 340 ponies. 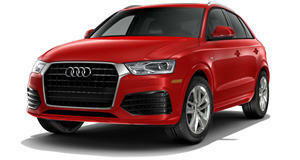 The base Q3 will likely come powered by a turbocharged 2.0-liter four-cylinder good for about 200 hp. The new Q3 program, it is rumored, will see the crossover built on parent company Volkswagen’s MQB platform, which also underpins both the A3 and TT, and other future models. The interior will feature Audi’s insanely cool Virtual Cockpit and head-up display, both of which we sampled on the new A4 sedan. Also expect the new Q3 to be slightly larger than the current model, measuring about 2.3-inches longer. Audi has also improved trunk space, a fairly common complaint today. In summary, a bit bigger inside and out, lighter, and, assuming Audi stays true to its word, a lore more powerful once the RS arrives.